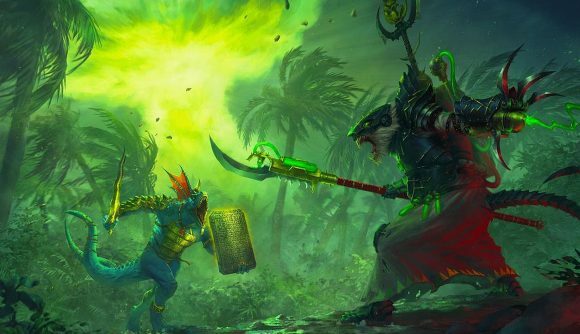 The latest Lord pack for Total War: Warhammer II is out tomorrow, and it adds the skink prophet Tehenhauin and the warlock-engineer Ikit Claw to the Lizardmen and Skaven races respectively. We wrote in our Prophet and Warlock review that it’s a great piece of DLC for the price, but many players were hoping to see at least one more race pack – a larger category of DLC that adds a new faction – before Warhammer III. That’s not going to happen. Creative Assembly confirms in a Reddit AMA earlier that “there are only Lord Packs remaining” for Total War: Warhammer II – something that was later reiterated for absolute clarity. So Warhammer II is getting more DLC, but fans who were hoping to see Araby, Dogs of War/Southern Realms, or perhaps even Albion any time soon will be disappointed. It’s all Lord packs from here, such as tomorrow’s The Prophet and the Warlock or last year’s The Queen and the Crone. Both those packs were pretty great, and added new Lords with new campaign mechanics alongside new units and a rework for previous factions to keep the campaign experience fresh. Undoubtedly there are plenty of fans who were hoping for more, however. The first game got three new races through post-launch DLC (five, if you count the at-launch Chaos Warriors or the free Bretonnia update), but Warhammer II only got two – the Tomb Kings and the Vampire Coast. Still, with Total War: Warhammer III having entered pre-production last summer, this is perhaps a sign that CA is moving resources to the next full game in earnest. No more races may mean it arrives that much sooner. And while it’s a little disappointing that Araby isn’t coming any time soon, it’s all-but certain that Warhammer III will get a truckload of post-launch DLC support. Everything is back on the table at that point.